"Ask not what your country can do for you, but what you can do for your country". In Hungarian: "Ne azt kérdezd, mit tesz érted az ország, hanem hogy Te mit tehetsz az országért!" The evening commenced with a special film, created just for the inauguration by Csapó Harold Gabor, depicting Americans of Hungarian origin and their cultural events in the US. This included the various events organized by the William Penn Association, the oldest (founded in 1886) and largest American organization with Hungarian roots, by the American Hungarian Federation (founded in 1906), as well as by the Hungarian Reformed Federation of America, and the Hungarian Scouts in Exteris (USA branch). Kata Csongrádi, famous Hungarian artist, was the Master of Ceremonies and sang a number of wonderful songs throughtout the evening and introduced the various speakers. The Reverend Lukács László, Piarist Father, said the opening invocation and gave a moving tribute in memory of Dr. Elemér Balogh, his old friend, and in honor of whom this Klub is being formed. Mr. Paul O’Friel, Commercial Couselor, US Embassy, gave a very uplifting talk about the wonderful historical relations between America and Hungary and wished the “Klub” well. The Founders of the Amerikai Magyar Klub thank Mr. O’Friel for his kind remarks. 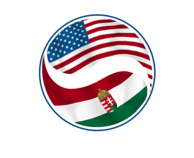 The Embassy had lots of information about America, and many Hungarians who visited the booth expressed their interest in further education in the US. Mr. Koncz Gábor, Director, and his assistant, Bába Szilvia, gave the greeting on behalf of the Magyar Kultura Alapitvány, which provided the venue for this event. The Founders thank you. Mr. Jules Gyula Balogh, President of the Amerikai Magyar Klub, followed by reading congratulatory letters from Bishop Archabbot Várszegi Asztrik of Pannonhalma, and from the Chairman of the William Penn Association, Stephen J. Varga. Zsuzsanna Dreisziger, Co-Founder of the Klub, followed by giving the Klub welcome speech in extraordinarily beautiful Hungarian, the theme of which was: be proud Magyar, everything is possible if you work hard. (available later in Hungarian). Mr. Balogh then followed with his opening remarks, touching on what made America great (its Constitution, freedom and justice, a religious and friendly people, entrepreneurial approach and opportunity for all, honesty and straight talk). He described his view of reconstructing Hungary, lessons from the financial crisis for Hungary, and the Klub plans for 2010. A write-up of the rest of the evening will be available shortly. Meanwhile please see the attached program brochure for a listing of the talks. The world famous Rajkó Zenekar (gypsy orchestra), under the direction of Gerendási István, gave extraordinary performances of the Ave Maria , sung by Vincze Lilla, the Second Hungarian Rhapsody, the Pacsirta, and an American song, Strangers in the Night. Previously, on November 4, they played at the personal invitation of the Pope in front of 80,000 people in Rome. They performed gratis for this event, recognizing the potential for the advancement of Hungary. The Founders thank you. HIR-TV covered the event and the live interview with Mr. Balogh and Ms. Dreizsiger on HIR-TV the day after the inauguration will be available later.